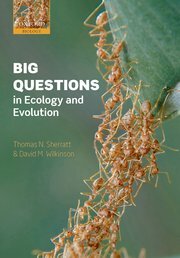 This book provides an introduction to a range of fundamental questions that have taxed evolutionary biologists and ecologists for decades. Some of the phenomena discussed are, on first reflection, simply puzzling to understand from an evolutionary perspective, whilst others have direct implications for the future of the planet. All of the questions posed have at least a partial solution, all have seen exciting breakthroughs in recent years, yet many of the explanations continue to be hotly debated. Sherratt, T, & Wilkinson, David M. (2008). Big Questions in Ecology and Evolution. Oxford University Press.